This has been an eclectic baseball season in the varied baseball career of Jerry Weinstein. In late September, the Los Angeles-bred Weinstein, 72, will be managing Israel’s entry in the quadrennial World Baseball Classic. From early June to early August, he piloted the Wareham Gatemen to a 25–15–4 record in the legendary Cape Cod (Massachusetts) Baseball League. He’s also got his regular job as the offensive coordinator throughout the Colorado Rockies’ minor league system. “I love the guy. He absolutely loves baseball,” Duquette tells the Jewish Baseball Museum. 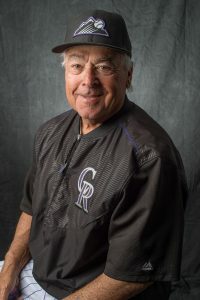 This is Weinstein’s seventh year with the Rockies, whose A-level team in Modesto, California, he managed and for whose major league staff he worked as a catching coach. Besides the Brewers, he’s also toiled for the Chicago Cubs and Montreal Expos. He won 16 conference championships in 23 years of managing at Sacramento City College, sending numerous players to the major leagues. Other collegiate experience includes five years as the pitching coach of California Polytechnic University, in San Luis Obispo, the town where he still resides. And in 2005, he led America’s team to the gold medal at the Maccabiah Games, in Israel. Weinstein spoke with the Jewish Baseball Museum by telephone while riding an exercise bike the day before he flew to Virginia. There, he’d be working a few days with Colorado’s AA team, the Hartford Yard Goats, when it played a series against the equally-colorfully-named Richmond Flying Squirrels. After, he’d continue preparing for his gig with Team Israel, whose qualifying games will be in Brooklyn, N.Y., beginning September 22. The squad consists primarily of Jewish Americans who’ve played in the major and minor leagues. If Israel wins its pool (which includes Great Britain, Pakistan and Brazil), it will advance for the first time to the WBC’s second round, in February 2017 in South Korea. What are you looking forward to about this experience? What appealed to you enough to even take this job? Weinstein: The thing that appeals to me is: It’s a good thing to do for baseball in Israel. I’ve been to Israel, I’ve seen the [baseball] program, and they’re severely underfunded. I think if we can win this thing, not only will we help them with their funding, but it will heighten the awareness of baseball in Israel. Then we can get more people involved and more resources into the program. What will be the biggest challenge in managing the Israel team? Usually, a manager has to build relationships with players and manage them simultaneously. But in Cape Cod, the season is so short – and with the Israeli team, it’s really brief, since you’ll all be together for just a week. The first thing you have to do in any environment is develop a network of trust. They have to know that you’re there for the right reason. The right reason is their development as a person and as a player. It’s not about you; it’s about the players. I always tell them that my job is to eliminate my job. In reality, you have to teach players how to coach themselves. The best lessons are self-taught, so if they have to always need you to drop them on top of the mountain or hold their hand, and they become co-dependent, that’s really not what we’re looking for. We need to have people who take charge of their own destiny, and they become their own best coach. That’s what we teach them to do. What are you thinking about now as you plan to manage Team Israel? There are a lot of unknowns there. Part of the unknown is the dynamics of the team you’re putting out on the field, which we’re not 100 percent [set on depending on player availability]. You just never know how the dynamics of a team are going to come together, and the culture – and of course, you don’t know the caliber of competition that well. Are there guys who’ll likely be on the team whom you’ve worked with or managed before? The only guy I’ve had a lot of contact with is Troy Neiman in the Rockies organization, who pitches at Modesto. Also, a guy who’s a reserve is [shortstop] Preston Grand Pre, who was on our Wareham team this summer. Whenever you’re familiar with your players, it helps you. That’s what we’re trying to do now, is become more familiar with the players we have. We talk to the players themselves, their managers, pitching coaches, pitching coordinators, farm directors; we try to get reports on the players. This isn’t about coaching players. It’s about putting them in a position to do what they can do. We’re trying to assess their strengths and weaknesses, and not ask them to do something they can’t do. When you say you won’t be coaching the players on Team Israel – meaning, because you won’t have them long enough? Right. We won’t have enough time to really know the players, based on seven days. Sometimes, it takes a whole season to learn about a player. When you look at this pool and the capabilities of the other three teams, is winning it a real possibility? Absolutely. We’re expecting to win. Great Britain and Brazil both have good teams. They have a lot of U.S. professional players. Brazil has a lot of players who play in the Japanese league, and they have some high-profile minor-league players in the United States. This will not be a walk-over. It’ll be a competitive environment. You were in Israel for the ’05 Maccabiah. Have you visited other times? I was there in November and had some meetings with the IAB [Israel Association of Baseball] board of directors. I met some people involved in baseball in Israel and saw some of the teams work out and play in Baptist Village, in Petach Tikva. I traveled through the country. How did the baseball scene in Israel strike you? The biggest void there is a lack of facilities. They need a bigger staff and more people involved. A handful of people are doing all the work, and they’re just spread too thin. It’s very similar to the way soccer’s been built in the United States. It has to be built from the ground up. You need a very broad base, so building programs in Israel is critical. Growing up, who were some people who were key influences on your Jewish identity? My mom was divorced and we lived, up until I was 12 years old, with my grandparents in West Los Angeles: Adrienne and Larry Lieberman. They lit candles on the Sabbath and went to shul on High Holy Days and were observant Jews. Were there athletes who were Jewish whom you looked up to? I really liked the Dodgers, so I certainly liked Sandy Koufax and the Sherry brothers. I was a big Dodger fan, and Koufax was a big part of that team, and Norm Sherry and Larry Sherry were on that team. The fact that Koufax didn’t pitch in the  World Series on Yom Kippur – I thought that was significant, that his religion was extremely important to him. Ever since we connected on Facebook last year, I’ve enjoyed your video clips and brief observations of intricate movements within a play. What is it about such minutiae that excite you enough to post them? I basically look at it that it has value for players and coaches – that from a teaching standpoint it will help them become better players. It’s trying to put more information in their file cabinets. It’s funny: I’ve done a lot of teaching and coaching and developing players, and when I go somewhere, I get more comments from people I don’t know who have read these [posts]. You were a coach on the U.S. Olympic teams in Barcelona in 1992 and in Atlanta in ’96. What was it like to participate in the world’s greatest sports event? Especially in Atlanta, that was unbelievable. I recollect making a mound visit, and there were 62,000 people in Atlanta Fulton County Stadium. It was like walking through a tunnel. It was pretty eerie. What’s funny is: That was not the biggest crowd I was involved with. In ’92, we played in Denver, at Mile High Stadium, on the 4th of July, and the Rockies were unveiling their new uniforms that day as well. [Major League Baseball’s Colorado Rockies began play the following season.] There were 76,000 people in that stadium because we were playing the Cubans in an international exhibition before the Olympics. Israel will be playing these WBC games in the “capital” of the Jewish population in the Diaspora: New York City. The joint will be jumping, and the place should be packed. Will that add to the experience for you? We’re hoping so. We need every little bit of help we can get.